DESCRIPTION: The work is based on the former activities of Bornhöveder ecosystem research (1989-2001). Mostly monitoring, modelings regarding the interaction of structural and functional ecosystem components have been carried out. Thereafter the monitoring activates were reduced to aspects of forests dynamics in particular under atmospheric deposition loads. However, the entire project data is used for developing systemic indicator models and understanding ecosystems as interactive in the landscape context with special regard of Ecosystem Integrity. Whilst the work is mainly based on existing results and maps, monitoring date on forest in compliance with the regulations of ICP-forests manual will be available furthermore. The installed instruments will be driven by a authority specialized on forest observation. Recently, the object of research on human-environment systems has been extended, and it was carried out detailed studies on the potential of landscapes and ecosystems for the provision of ecosystem services. 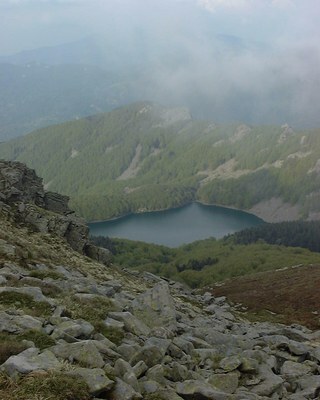 DESCRIPTION: Two high-mountain lakes. Low level of instrumentation. Morskie Oko is located in the timber zone in "High Tatra" Mountains within the area of Tatra Mountains National Park. This is deep (51m) ultraoligotrophic postglacial lake inhabited by natural fish stock. 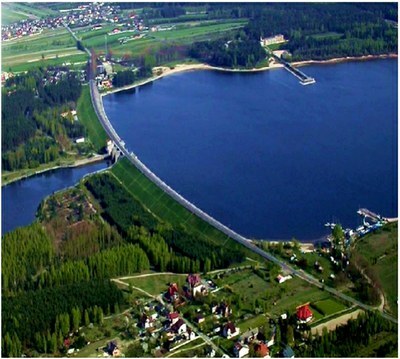 It is connected with fishless Czarny Staw lake that is located 200m above it. Czarny Staw is located above timber zone. This is deep (76m) ultraoligotrophic postglacial lake. One of the very few permanent lakes void of fish stock. Both lakes are missing littoral vegetation. They are typically frozen since November-December till May-June. 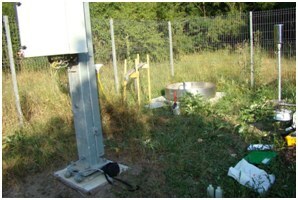 On the shore of MO there is located well equipped shelter, where temporary lab may be set-up. Both lakes are heavily visited by tourists, yet access to the lakes is highly restricted. Main research topic: Role of predation in structuring of plankton communities. Main LTER parameters: O2 concentration, temperature, conductivity, humidity, water transparency by Secchi disk, algal and cyanobacteria biomass, C and N content, zooplankton (mesoplankton: cladocerans, copepods). DESCRIPTION: Protected in 1968, Doñana National Park (537 km2) is a UNESCO Biosphere Reserve, a Ramsar Site and a Natural World Heritage Site. It contains the largest wetland in Western Europe, a intricate matrix of marshlands (270 km2), phreatic lagoons, a 25 km-long dune ecosystem with its respective shoreline and representative Mediterranean terrestrial plant communities. Doñana LTSER platform comprises both the protected area and the surrounding territories (2736 km2) where a complex landscape matrix composed by rice fields, fisheries, irrigated crops, berry greenhouses, vineyards, olives and pine afforestations hold the tributary streams that pour their water to the fluvial marshland, the main figure of Doñana. 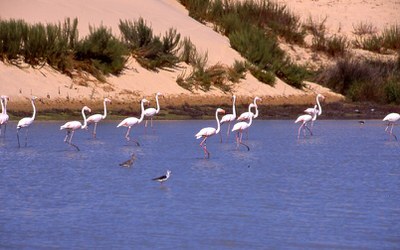 Doñana surroundings hold over 180000 permanent inhabitants. More than 60% of the employment is concentrated on the agricultural sector, and another 25% is devoted to the service sector, which is mainly focused on tourism. Doñana ICTS (Singular Scientific and Technological Infrastructure) was awarded in 2006 by Science and Innovation Ministry to Doñana Biological Reserve on behalf of Doñana Biological Station, a research centre of CSIC (Spanish Research Council). The integrated monitoring program includes more than 80 standardised and scientifically supervised methodological protocols producing up to date results on biodiversity status and natural processes trends. For many of these monitoring targets data has been collected since the early 70’s. The diverse Doñana major ecosystems, shoreline, dunar system, marshlands, river estuary, aquifer lagoons and Mediterranean shrublands and woodlands are fully covered both by traditional manual and automatic monitoring protocols and devices. DESCRIPTION: Kiskunság is a 8900 km2 region in Central Hungary. The mostly sandy area is extremely heterogeneous. KISKUN LTER focuses on studying the effects of climate change (more frequent and intensive droughts and longer vegetation period) and land use change (abandonment of arable fields, decrease of grazing, and afforestation) on biodiversity as well as ecosystem functions and services. - highly equipped experimental climate simulation site. 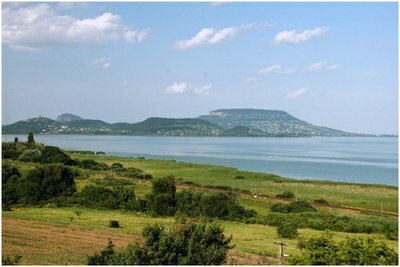 DESCRIPTION: The site is a large shallow lake, a popular holiday resort. The lake went through considerable changes in trophic state during the past decades, and a substantial amount of work has been devoted to monitoring related community shifts and revealing causal relationships between the described changes and ecosystem processes. These studies are conducted by the Balaton Limnological Institute. Research facilities include an isotope laboratory, a microscopy lab, laboratories for water chemistry, phytoplankton, macrophyte and macroinvertebrate research, a lab for managing microalgal cultures, a GIS lab, sample storage rooms with freezers, a research vessel and motorboats. High tech equipments include mass spectrometry, HPLC, a fluorescent spectrophotometer, epifluorescent microscopes and a flow cytometer, while underwater light sensors and portable instruments for water chemistry are available for field measurements. Main research topics: nutrient cycling, humic substances, phytoplankton community changes, macrophyte ecophysiology, zooplankton and zoobenthos, food web relationships, fish population dynamics and environmental toxicology. Main LTER parameters: water temperature, water chemistry (pH, nutrients, etc. ), phytoplankton biomass and composition, chlorophyll a concentration, aquatic macrophytes, zooplankton abundance and composition, benthic macroinvertebrates, fish. DESCRIPTION: The site Lake Ecosystems of Sardinia consists of six artificial lakes and is part of the LTER-Italy since its inception. 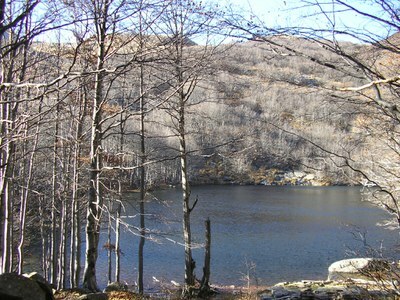 The site has always been managed by the Department Natural Sciences and Environmental Resources, in close collaboration with the Sardinian Water Authority for lakes (ENAS - ENte Acque della Sardegna). The six lakes are located in north-central part of the island and are being studied for over thirty years. For all Sardinian lakes listed in the LTER network the main activities are oriented to study eutrophication and phytoplankton in relation to the use and characteristics of catchment areas, possible disturbances and to the global climate change. The collected data series mainly regard the dynamics of phytoplankton and trophic status, with particular attention to toxic blooms of cyanobacteria, due to the use of water for drinking supplies. DESCRIPTION: Lake Maggiore is the second largest and deepest Italian lake and an important freshwater resource. It has been studied since 1940 thanks to the CNR Institute of Ecosyste Study active on its shore. The evolution of the lake passed from a pristine state to an eutrophic and again to an oligotrophic state due to the decrease of phosphorus input. This large lake is important for tourism, irrigation of rice and maize fields and for professional fisheries. Phosphorus is the limiting factor for its primary production while nitrate is the most abundant nitrogen compound in the lake. 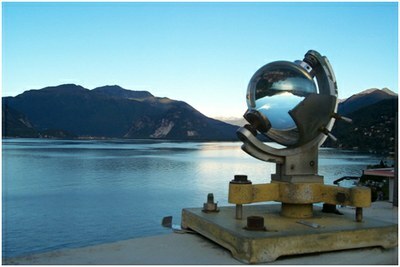 The main effect of the ongoing climatic change on Lake Maggiore is the increase of the heat content of the lake, that affected the deep hypolimnion. It is likely that the reduction of mixing events will affect also the biota of Lago Maggiore. Main research topic: Main research topics conducted on the lake are related to the study of the evolution of several variables from meto-climate, to physico-chemical and biological parameters. Special interest is dedicated to the microbial component. Specific research topics are: circulation mechanisms of lake water, ecological effects of climate changes, phytoplankton, picoplankton and bacterial biodiversity, photosynthetic and dark carbon uptake, benthos diversity, zooplanktonic food web, fish stock evolution, paleolimnology. Main LTER parameter: Long-term data sets are available of the main chemical, physical and biological parameters. LTER parameters monitored in the lake are: physico and chemical parameters, chlorophyll. DESCRIPTION: The Bernatowicz type of sampler/The Brnatowicz grab; Secchi disc; conductivity electrometrically by Yellow Springs apparatus, model 33; pH by ph-meter Hanna type HI99100; hand net. Main LTER parameters: Water transparency, conductivity, pH; the species composition, range of occurrence, frequency and biomass of submerged macrophytes; the species composition and dominant structure of gastropods in shallow littoral (on the stony bottom, sand bottom, macrophytes emerged, submerged and with floating leaves). DESCRIPTION: Lake Päijänne LTER site constitutes one of the biggest lakes in Finland with almost 300 000 habitants in surrounding areas. The lake has been heavily polluted but its condition has been improved, and today the lake has both high economic and social importance for a significant proportion of the Finnish population. There is a long experience of lake research in the L. Päijänne area, including some long-term data series. Research at L. Päijänne is diverse and is already well-equipped with instrumentation supporting long-term monitoring. The research covers large scales from hydrology to fish stock assessment. 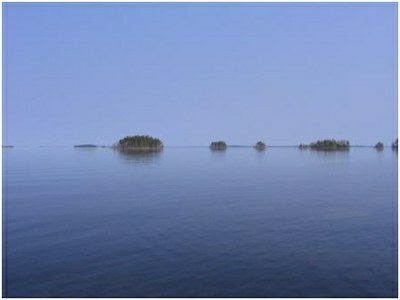 The aim of the Lake Päijänne LTER-site is to use Lake Päijänne as a model area for sustainable use of lake ecosystem services and predict climate change effects on the lake and its ecosystem services. DESCRIPTION: Lake Santo Parmense is an oligotrophic dimictic lake of glacial-tectonic origin. It is the largest and deepest natural water body in the Northern Apennines, with a maximum depth of 22.5 m. The period of ice cover usually lasts from November to May. It was naturally fishless, but underwent regular fish stocking since the beginning of the 20th century. Limnological research on the lake started in the 1950s and continued until nowadays, although with several discontinuities over the period. On the shore of the lake there is a hut (Rifugio CAI Mariotti) with a restaurant, dormitories and meeting room, 220 V power supply (open in summer and on request in other times too). It can also be reached by a chair lift. 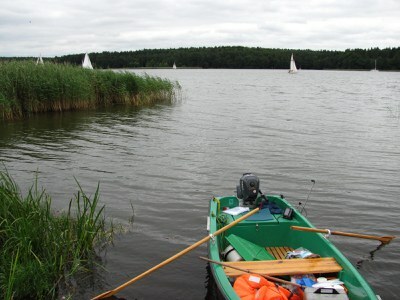 A small boat is permanently stationed at the lake and available for sampling operations. Main research topics: phytoplankton and zooplankton ecology and phenology, predation/competition interactions and energy fluxes through pelagic food web, evolution of trophic state, sensitivity to acidification and climate change. Main LTER parameters: maximum depth, Secchi disk transparency, temperature, pH, electrical conductivity, dissolved oxygen, total alkalinity, nutrient (NO3-, NH4+, NO2-, PO43-, SiO2) and Chl-a concentrations throughout the water column, phytoplankton and zooplankton composition and abundance. DESCRIPTION: Lake Scuro Parmense is an oligotrophic dimictic lake of glacial origin. Maximum depth reaches 10.4 m, but the lake often undergoes strong seasonal fluctuations in water level. The period of ice cover usually lasts from November to May. Although naturally fishless, fish has occasionally been released in the lake over the years. Limnological studies on this lake started in 1986 and continued until nowadays, although with discontinuity. Main LTER parameters: maximum depth, Secchi disk transparency, temperature, pH, electrical conductivity, dissolved oxygen, total alkalinity, nutrient (NO3-, NH4+, NO2-, PO43-, SiO2) and Chl-a concentrations throughout the water column, zooplankton composition and abundance. MAIN ECOSYSTEM/HABITAT type (Eunis classification): Inland surface waters. DESCRIPTION: In terms of the Water Framework Directive 2000/60/EC ( Annex XIA), the river Mesta is located in the Eco-region 7 (Eastern Balkans). Mesta (Nestos) River rises in the Rila Mountains in SW Bulgaria and flows some 260 km trough territories of Bulgaria (129) and Greece (130) before discharging the North Aegean Sea. At the Bulgarian territory Mesta River is mountain stream with average altitude of the catchments area 1318 m what define it as a highest river valley in Bulgaria. Mesta catchments basin is situated in the zone of the European-continental climatic influence and snow-rainy. feeding. Bulgarian part of the Mesta River has 129 km length with catchments area surface 2 267 km2 and 25 tributaries along the river. The biggest one is Dospat that flows into Mesta in the Greece territory. 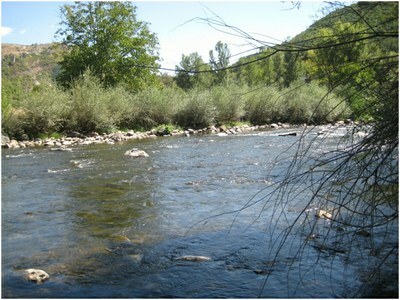 River Mesta is regarded as one of the most natural streams found in South Europe. The status of protected areas of most of the right-side tributaries in high-mountains preserves water quality, but not the amount of potential water abstraction for increasing human needs. Left-side tributaries suffer from intensive deforestation of large areas and thus minimizing the water generation capacity of the watershed. Gradual decreasing of total water discharge following global changes and aridisation of the regions, especially in its southern sectors of the basin and watercourse. Main research topic: Mesta river was selected as a model watercourse as far as its ecological status has been well studied for the last 30 years in terms of it hydrology, water quality, benthic invertebrate fauna, community trophic structure, and other ecological quality elements. 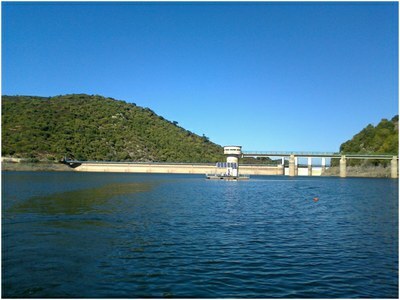 The system offers a possibility of the ecological situation variety and river types as well as developed river system and indicative basic continuum gradients. The water ecosystem is subjected to organic pollution determining saprobic processes irrelatively pure form and wide range of the saprobity. Conditionally two main periods, determining ecological situation in the Mesta River, were described: before 1990 г., when heavy organic pollution conditions dominated, and after 1990 г. – when processes of recovering and stabilization were observed. Essential changes of the species diversity occurred after 1990 leading toward species composition enrichment with new taxa and loss of others non-adequate in the new ecological situation. As a result of decreased loading with organic matter from industrial origin water quality of the different sites is improving and entire ecological situation of the Mesta River is getting better. Main LTER parameters: According to Water Frame Directive (2000/60/ЕU) (European Parliament and the Council of European Union 2000), all countries members of the EU have to achieve good ecological state of the water bodies. Along these lines biological monitoring is a leading and among obligatory biological parameters for water body’s quality assessment are macrozoobenthos, ichthyofauna, phytobenthos (diatoms) and macrophytes. As regards to macrozoobenthos a considerable data-massif including long-term period (1978-2012) is composed. It should be pointed out that the available hydrological and hydrochemical (water temperature, pH, oxygen concentration/saturation, conductivity, nitrates, phosphates) parameters include 30 years period. The last three decade investigations are connected mainly with detail studies on the species diversity and trophic structure of the macrozoobenthos.Considerably fewer are the data on the other three biological elements of Mesta River, which to date has not been an object of regular and long term investigation. MAIN ECOSYSTEM/HABITAT type (Eunis classification): Arable land, Broad-leaved Forest, Built-up areas. DESCRIPTION: The Neajlov River and its catchment are a tributary and a sub-catchment of the river Arges, which in turn is one of the main tributary for the lower Danube river stretch. The Neajlov river catchment belongs also to the four administrative units (counties) – Arges, Dimbovita, Giurgiu and Teleorman. 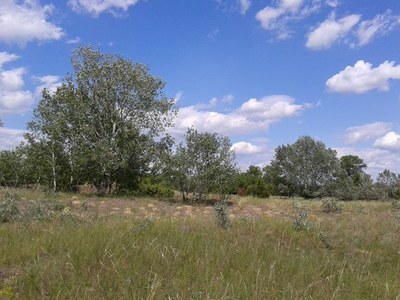 The main categories of land use in the Neajlov catchment are represented by the arable, forest, rural and urban built-up areas. The landscapes structure from Neajlov catchment is dominated by man-controlled and subsidized ecosystems or agricultural ecosystems. However significant changes in the structure and management of the agricultural ecosystems occurred after 1990, when state owned and large (thousands of hectares) crop farms and animal husbandry have been replaced by small (10-15 hectares) or very small (1-3 hectares) subsistence farms. The process of restructuring the land ownership and farming systems has been accompanied by a significant land abandonment, which accounted almost 25% from agricultural land after 2000 (Postolache, C., 2004). In addition the irrigation system and the intensive agricultural practices have been almost abandoned, which in turn diminished up to very low level the water demand and the nutrient emission into ground and surface water bodies. The major crops in the former intensive state and collective farming systems were – corn, wheat, barley, sunflower and beet. The structure of crops has been preserved at the smaller scale and based on non-intensive agricultural practices. The increase of arable land and the weight of agricultural ecosystems were done in the last century (in particular after 1950) by replacing the natural and semi-natural forests, wetlands and grasslands. The total human population inhabiting the Neajlov catchment is 260400 individuals with a negative growth rate(r), after 1990, which reached the lowest level of -0.57 % in 1999. MAIN ECOSYSTEM/HABITAT type (Eunis classification): Surface standing waters, Permanent eutrophic lakes, ponds and pools, Littoral zone of inland surface waterbodies, Species-rich helophyte beds, Water-fringing reedbeds and tall helophytes other than canes. SIZE (ha): The total territory of the Srebarna Biosphere Reserve is 902.1 ha including the shallow holo-polymictic Srebarna Lake with slightly alkaline to neutral waters and the Danubian island Devnia. RAMSAR Site is 638 ha. DESCRIPTION: The lake of Srebarna, situated in North-Eastern Bulgaria on the right bank of the Danube (440 05’’ n.l. and 270 07’’ e.l.) between the river kilometres 393 and 391, is located in a karstic depletion surrounded by three hills. The watershed basin covers area of 1,070 km2 and is formed of the basins of the rivulets Srebrenska, Babukska and Kalnezha. A hyper-eutrophic lake, the Nature Reserve, is exclusive state property, and the adjoining land tracts are private property or municipal property. Commercial fishing and mowing of Reed, Reedmace and Bulrush in the Reserve was discontinued in 1975. Since then, the natural resources have not been exploited. 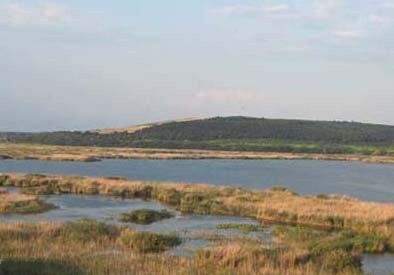 The Srebarna Lake was designated as a Monument of World Cultural and Natural Heritage (1983), UNESCO biosphere reserve (1977), Ramsar site (1975) and Important Bird Area (1990) because of its extremely rich ornithofauna and mainly because of the breeding of globally threatened species Dalmatian Pelican (Pelecanus crispus), Pygmy Cormorant (Phalacrocorax pygmeus) and Ferruginous Duck (Aythya nyroca). During the last years the lake ecosystem underwent significant changes towards strong eutrophication and anthropogenically speeded-up succession. The main reasons were the interrupted connection with the Danube River (because of a dyke built in 1948) together with the pumping-out of the underground waters, as well as the agricultural changes and activities in the watershed basin. The restoration activities carried out in 1993-1994 and especially the canal which connected the lake with the Danube lead to the beginning of lake recovery. All these events influenced the biodiversity of the reserve. The Institute of Biodiversity and Ecosystem Research – Bulgarian Academy of Sciences (IBER - BAS) dispose with Laboratory and Education Centre in Srebarna Village near the Srebarna Biosphere Reserve. In the Laboratory are performing the hydrobiological, microbiological and ornithological studies. The exhibition in the Education Centre has three aquariums, 2 terrariums and 23 posters, which present the history and biological diversity of the reserve. The IBER - BAS have also Field Station - a house in Srebarna Village (Silistra District). In the house there is 3 badrooms, two kitchens, two bathrooms and a storage place. Near the house there is also a garden with some fruit trees and vegetables. Equipment: Laboratory spectrophotometer for nutrient analysis, in-situ O2, T, pH and conductivty meters, laboratory microscopes equipped with camera for phytoplankton and zooplankton, fishing and plankton nets set, bottom samplers, plastic boat - 3 m.
Main research topics: Functional monitoring and processes of river and wetland ecosystems; conservation actions for Dalmatian Pelican. DESCRIPTION: The platform comprises of two freshwater sites: the Pilica River Floodplain and the Sulejow Reservoir. 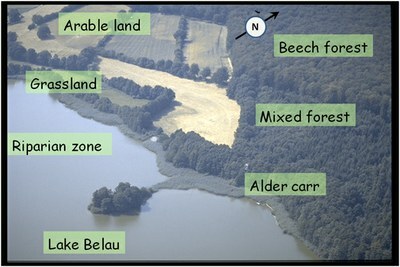 The research area is located in the middle section of the river, in the Pilica River valley, including the reservoir and its direct catchment, where smaller plots are located for analysing surface flow, groundwaters, and the role of land/water ecotones in the regulation of nutrient cycling. There is a number of sampling sites/points located on the reservoir, in which three are permanent since 1980's and serve as a data source on water chemistry, while the others are sampled periodically for certain purposes, e.g. fish (including 1+), phytoplankton, zooplankton, sediment depositon, groundwater level, groundwater chemistry. The site encompasses also experimental plots and channels, a field station with a small laboratory, a lecture hall for 15 people and housing for 10 people. - development of the method of reduction of the matter transported by the river to the reservoir by the optimization of nutrient retention in the floodplain areas. 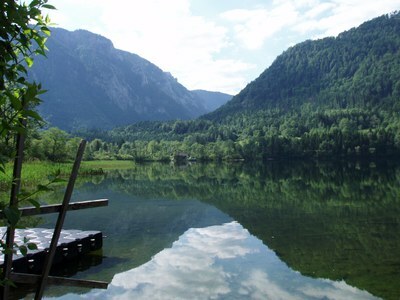 DESCRIPTION: The WasserCluster Lunz (WCL) is responsible for a master site of LTER Austria and is an interdisciplinary freshwater research centre. It provides an excellent opportunity to study the ecological processes in a nearly undisturbed ecosystem (terrestrial and aquatic) by human impacts and offers a large historical ecological dataset with different environmental parameters (since 1905). For lab and field experiments e.g. a gas chromatography-mass spectrometry (GC-MS), high performance liquid chromatography (HPLC), Confocal Laser Scanning Microscopy, Flow cytometry, nutrient and DOC analyser, spectrofluorometer, a motorboat, a measurement platform on the lake, automatic water samplers, YSI multi-parameter sondes, two remote controlled GHG-Sentinel (CO2 and CH4), climate station, runoff and piezometer gauges are available. Main research topics: The focus of the research lies on basic and applied aquatic ecosystem research, including aquatic microbial ecology, aquatic food chain research, biogeochemistry, ecotoxicology, restoration ecology and the management of streams, rivers and lakes. Besides conducting field research, the WasserCluster focus on developing innovative experimental laboratory research. The WasserCluster combines scientific expertise with modern technology to facilitate innovative research for the conservation and sustainable use of aquatic resources. MAIN ECOSYSTEM/HABITAT type (Eunis classification): Lake, lowmoor, transitional moor, highmoor, marshy coniferous forest, humid coniferous forest, alder carr, wet meadows. 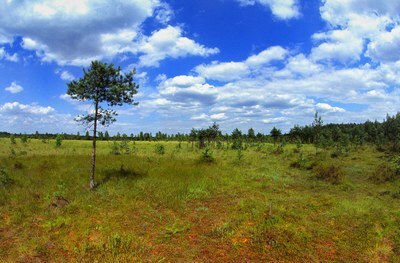 DESCRIPTION: The West Polesie Biosphere Reserve was established in 2002 on the area 139 917 ha. It includes almost the whole physiographic subregion: Łęczna – Włodawa Lakeland. The flatness of the terrain and shallow-lying first level of ground waters cause that considerable parts of the Lakeland are permanently or temporarily water-logged. 61 lakes occurs here. Plant cover of this area are a miniature of European tundra and forest-tundra. This is the area of unusual variety of highmoors, transitional moors, lowmoors and – in some places – carbonate moors. There appear 1466 species of vascular plants. There are also 350 species of water non-vertebrates, 35 ichtio-fauna species as vell as 150 species of birds. Main research topics: Ecology of hydrogenic landscapes, hydrobiology, biology and ecology of rare plant & fauna species, landscape connectivity, land-use transformation, wetland evolution, wetland restoration, nature conservation management. Main LTER parameters: Meteorology (Air temperature and humidity, precipitation, wind speed, irradiance, etc. ), Freshwater quality, including nutrient, Abundance/distribution of selected plant vesicular specie, Abundance/species composition/distribution of selected zooplankton species, FISH: Abundance/species composition/distribution of selected species, Abundance/distribution of selected bird species, Mammals migration (ecological corridors), Land-use structure: pattern and dynamics, Fragmentation of natural areas.